Brucellosis is a major health problem in many parts of the world, particularly in the Mediterranean area and the Middle East. It is a multisystem disease with a broad spectrum of clinical manifestations. Humans are commonly infected through ingestion of raw milk, cheese, or meat, or through direct contact with infected animals, products of conception, or animal discharge. We report the case of a 41-year-old male patient admitted with multiple organ involvement due to Brucella species. A 41-year-old male with no previous significant medical history had fever and shivering of 2-week duration which improved spontaneously; 6 weeks later, he presented to the hospital with a 2-week history of fever and dizziness, epigastric pain of 2-day duration, and during admission to the hospital, he complained of left lower back pain. He was working in a construction company, but over the last year, he had changed his job to caring sheep and gout. He did not consume alcohol, nor had any elicit sexual relationships, travel, trauma, or skin rash. On examination, he looked sick, was fully conscious, febrile with a temperature of 38.9°C, no neck stiffness, his chest and heart examinations were normal, his abdomen was soft with mild epigastric tenderness and normal bowel sound in addition to bilateral enlarged nontender testes (mainly right), with three discrete right inguinal lymph nodes of <1 cm, and back examination revealed tenderness with limitation of movement on the left sacroiliac joint. The hematological profile and liver and renal function tests were within normal limits; his blood glucose was high for the first time in his life (12.5 mmol/l), with glycosylated hemoglobin of 10.1%. Serum amylase and lipase were markedly elevated (amylase: 239 U/L; reference range: 13–53 U/L and lipase: 674 U/L; reference range: 13–60 U/L). Computed tomography scan of abdomen showed bulky pancreas suggestive of pancreatitis [Figure 1]. The cerebrospinal fluid (CSF) had a clear appearance but revealed pleocytosis with cellular count of 82/mm 3 leukocytes (80% lymphocytes) in CSF mainly lymphocytes/dl and high protein level of 2.36 g/l with normal sugar of 4.4 mmol/L (simultaneous blood glucose: 7.6 mmol/L), negative polymerase chain reaction for tuberculosis as well as Venereal Disease Research Laboratory; cranial magnetic resonance imaging (MRI) showed normal images. 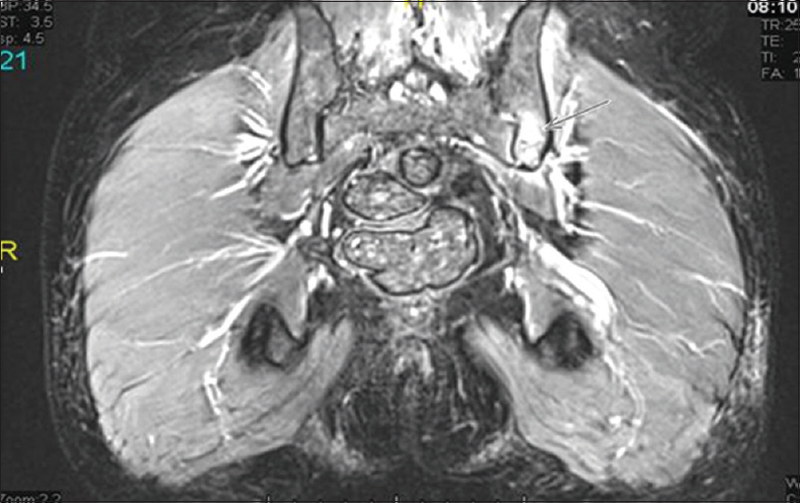 Bone scan and MRI showed left sacroiliitis [Figure 2]. 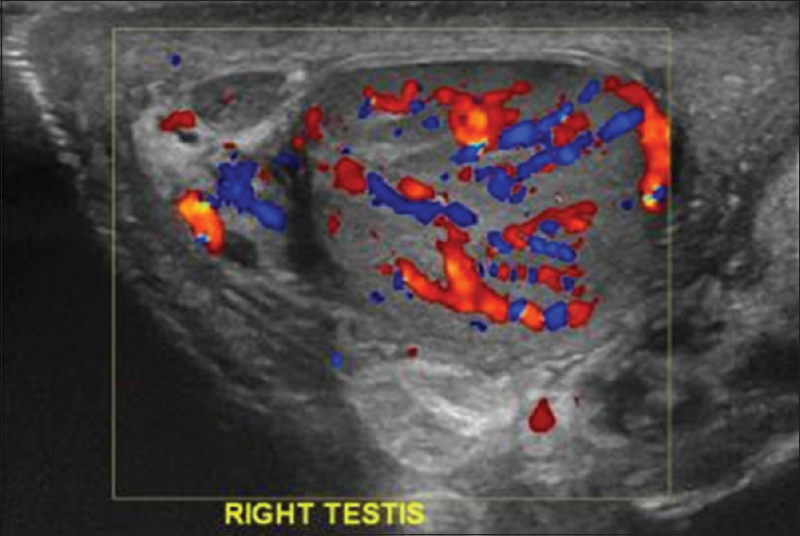 Ultrasound testes showed evidence of bilateral chronic epididymo-orchitis with foci of calcification and acute change in the right testes [Figure 3]. Urine and sputum acid-fast bacilli, serum Quantiferon ® test, anti-HIV antibodies, rheumatoid factor, and antinuclear antibody tests were all negative. Blood culture showed coccobacilli of Brucella species, the serology showed Brucella melitensis antibody of 1:5120 and Brucella abortus antibody of 1:1280. The patient was started on doxycycline 100 mg twice a day plus rifampicin 600 mg/day in addition to ceftriaxone 2 g intravenous twice a day; during this period, the patient was followed up clinically, biochemically, and radiologically. His scrotal swelling resolved completely which was also proved by ultrasound scrotum [Figure 4]. After 10 weeks of treatment, his CSF cell drop to 15 cells with 99% of lymphocytes and protein of 0.7 g/L, his pancreatic enzyme returned to normal levels, and he was discharged with the plan of continuation of intravenous ceftriaxone till 2 weeks after normalization of CSF in addition to continuation of oral antibiotics for a total course of 6 months. Brucellosis is hyperendemic in the Middle East, especially in Iraq, Syria, Saudi Arabia, and Turkey. In Qatar, there are no studies that show a clear epidemiology of the disease, but there are a lot of reported cases mainly of melitensis type. Brucellosis in endemic and nonendemic regions remains a diagnostic puzzle due to misleading nonspecific manifestations and increasing unusual presentations, so a high index of suspicion is needed to reach the correct diagnosis. It is important to obtain a detailed history which includes occupation, avocations, travel to or living in enzootic areas, and ingestion of high-risk foods, such as unpasteurized dairy products. In fact, our patient did not present with typical findings of brucellosis such as sweating which is usually drenching type, muscle ache, joint ache, and his main complaints were fever, abdominal pain, dizziness, and scrotal swelling. He initially concealed his occupational history of sheep rearing due to which the clinical scenario appeared bizarre. Gastrointestinal manifestations are noted in 40% of patients with brucellosis. Acute pancreatitis associated with Brucella infection is extremely rare and only five cases have been reported in the literature until now.,,,, Our patient had symptoms and signs of pancreatitis proved both by laboratory and imaging study, moreover he was discovered to have diabetes mellitus for the first time, which may be related to his problem and this showed mild improvement after treatment of his condition. To our knowledge, only Bagriaçik et al. reported one case of impairment of glucose metabolism during the course of brucellosis, possibly due to pancreatic involvement. Our patient's blood glucose trend improved as his glycosylated hemoglobin dropped from 10.1% on admission to 6.2% on discharge. Neurological involvement can occur in <5%–7% of all Brucella cases  due to involvement of meninges, cerebral vessels, central nervous system, cranial and peripheral nerves, which can present as meningoencephalitis, polyradiculopathy, radiculitis, acute demyelinating disease, or psychiatric problems, and can be acute or chronic. Our patient presented with dizziness only, so we considered the possibility of chronic meningitis, this is why we decided to proceed for lumbar puncture which proved the condition and the initiation of ceftriaxone had a dramatic improvement. The frequency of osteoarticular disease in the Mediterranean region has been observed as 33.7%–43%, this has been shown by a study conducted by Demiroglu et al. in Turkey. Spondylitis and sacroiliitis are the classic forms of metastatic disease, but not bursitis, tenosynovitis, enthesopathies, and arthritis. Turan et al. found that sacroiliitis is the most common type of osteoarticular involvement in Turkey which usually occurs unilaterally. Our patient had only sacroiliitis without subcutaneous abscess formation which showed gradual improvement on treatment. 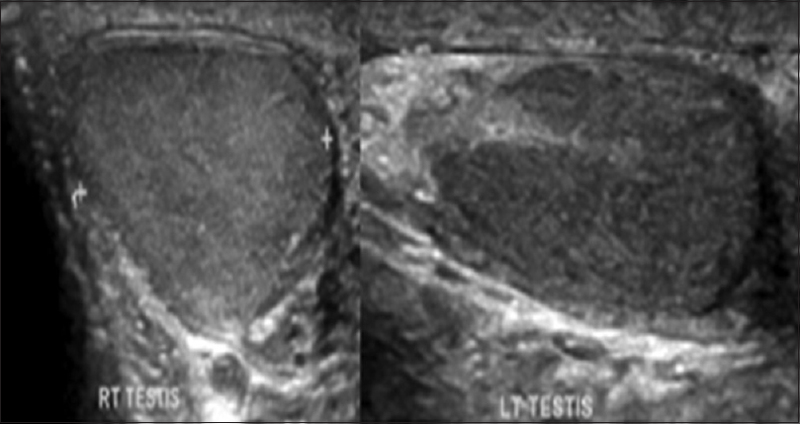 Epididymo-orchitis is the most common genitourinary complication, the incidence of it is estimated to be 2%–20%. Khan et al. reported from Kuwait that 35% of the cases of epididymo-orchitis in their series were caused by brucellosis. The patient in our case had bilateral epididymo-orchitis which responds to treatment. In brucellosis-endemic areas, clinicians should take careful history, a meticulous physical examination, and a rapid laboratory evaluation to diagnose brucellosis, especially if patient presents with multisystem involvement, moreover to consider that pancreatitis could be a presenting diagnosis. Sevinc A, Buyukberber N, Camci C, Buyukberber S, Karsligil T. Thrombocytopenia in brucellosis: Case report and literature review. J Natl Med Assoc 2005;97:290-3. Pappas G, Akritidis N, Bosilkovski M, Tsianos E. Brucellosis. N Engl J Med 2005;352:2325-36. Madkour Monir M, editor. Gastrointestinal brucellosis. In: Madkour's Brucellosis. 2nd ed. Berlin, Germany: Springer-Verlag; 2001. p. 150-8. Papaioannides D, Korantzopoulos P, Sinapidis D, Charalabopoulos K, Akritidis N. Acute pancreatitis associated with brucellosis. JOP 2006;7:62-5. Berber I, Erkurt MA, Yetkin F, Unlu S, Yilmaz S, Bentli R, et al. 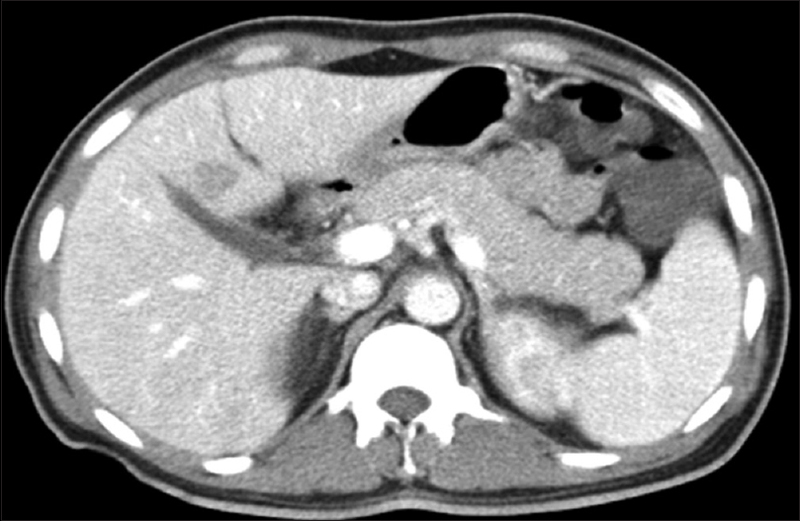 Arare disease in the differential diagnosis of acute pancreatitis: Acute brucellosis. Intern Med 2014;53:2401-4. Odeh M, Oliven A. Acute pancreatitis associated with brucellosis. J Gastroenterol Hepatol 1995;10:691-2. Alemán MC, Alegre J, Marqués A, Suriñach JM, Fernández de Sevilla T. Acute pancreatitis in the course of brucellosis. An Med Interna 1994;11:311.
al-Awadhi NZ, Ashkenani F, Khalaf ES. Acute pancreatitis associated with brucellosis. Am J Gastroenterol 1989;84:1570-4. Bagriaçik N, Oker C, Biyal F. A case of disturbance of glucose metabolism regulation in the course of a brucella infection. Turk Tip Cemiy Mecm 1969;35:136-44. Bucher A, Gaustad P, Pape E. Chronic neurobrucellosis due to Brucella melitensis. Scand J Infect Dis 1990;22:223-6. Shakir RA, Al-Din AS, Araj GF, Lulu AR, Mousa AR, Saadah MA. Clinical categories of neurobrucellosis. A report on 19 cases. Brain 1987;110(Pt 1):213-23. Demiroglu YZ, Turunç T, Aliskan H, Colakoglu S, Arslan H. Brucellosis: Retrospective evaluation of the clinical, laboratory and epidemiological features of 151 cases. Mikrobiyol Bul 2007;41:517-27. Turan H, Serefhanoglu K, Karadeli E, Togan T, Arslan H. Osteoarticular involvement among 202 brucellosis cases identified in Central Anatolia region of Turkey. Intern Med 2011;50:421-8. Bayram MM, Kervancioglu R. Scrotal gray-scale and color Doppler sonographic findings in genitourinary brucellosis. J Clin Ultrasound 1997;25:443-7. Mikolich DJ, Boyce JM. Brucella species. In: Mandell GL, editor. Principles and Practice of Infectious Diseases. NewYork: Churchill Livingstone; 1990. p. 1735-41. Khan MS, Humayoon MS, Al Manee MS. Epididymo-orchitis and Brucellosis. Br J Urol 1989;63:87-9.